What is one to make of this focus series … Big Deals: What It Means to Have the Giants Investing in Robotics … with the giants being Google, Amazon and Apple (as given in the preamble)? The assumption, of course, is that robotics investments by these companies represent a turning point in the evolution of robotics — perhaps something wholly different, outside the normal ebb and flow of robotics investments, acquisitions, and mergers. It is also assumed that the investments represent some type of trend, or at least have something in common. The Google, Apple and Amazon robotics investments do share much. First, each of these investing companies are considered large, particularly when measured by their market value. The market cap of Apple, Google and Amazon is approximately $468B, $409B and $164B, respectively. All three are Fortune 500 companies (For 2013, Apple 6, Amazon 49 and Google 55), and are listed on the Forbes Global 2000 (For 2013, Apple 15, Google 68 and Amazon 525). Each of these large companies is also considered innovative and forward thinking, capabilities usually associated with smaller, entrepreneurial firms. But this can also be said of many other large enterprises, although “innovation” per se can be difficult to gauge (unlike market cap, sales revenue and profitability) and the ranking process is usually biased in some way. A comparison of the Forbes list of the world’s most innovative companies with that of Fast Company, and again with Thomson Reuters’ Top 100 Global Innovators (Amazon not even listed), demonstrates the difficulty of quantifying innovation, and provides a great example of expectation bias at work, especially on part of Fast Company. The Google, Amazon and Apple robotics initiatives have legitimized and substantiated robotics for businesses, entrepreneurs and investors in a way that Mars rovers and military drones cannot. There is no disagreement that Google, Apple and Amazon are some of the most recognized brands in the world (see here and here). It is on the strength of their respective brands … in a way a measure of their cultural standing … that the announcements of the companies’ robotics initiatives and acquisitions made such an impact. That each company has made a substantial investment in robotics technologies fired the imagination of the public and invigorated the robotics community (business and technology media outlets went positively orgasmic!). That’s a good thing — a very good thing — in ways too numerous to list here. At the very least (and this might be the most important aspect of the various deals) the Google, Amazon and Apple robotics initiatives have legitimized and substantiated robotics for businesses, entrepreneurs and investors in a way that Mars rovers and military drones cannot. I would argue that the Google, Apple and Amazon investments do not herald a new robotics era, or even a new overarching trend. Instead, they are the logical consequence of robotics technologies becoming ever more powerful (even as they become less expensive), and being exploited by companies to further business aims. The investments also follow the typical usage progression for advanced technologies beginning with research, then moving on to the government/military, then on to business, and ending with consumers. Google, Apple and Amazon are not consumers in the general sense, but they are consumer-facing (mostly), which is another point of commonality. Google, Apple and Amazon have very different business models, and their robotics acquisitions and initiatives reflect this and should be viewed in this light. Apple, as a designer and manufacturer of computers, tablets, and mobile phones, is investing in robotics to increase productivity during manufacturing, reduce costs and improve quality in the process. According to Apple’s annual 10-K report, the company anticipates using approximately $10.5B in capital expenditures (CapEx) for investments such as new tooling and manufacturing equipment, including assembly robots and high-precision milling machines. The technology will be installed in Chinese manufacturing companies such as Foxconn and Pegatron, as well as in facilities located in the US and elsewhere. In this way, Apple is using its vast cash holdings as a competitive weapon as it battles competitors (for example, Microsoft and Sony for tablets, and Samsung, LG, ZTE and Huawei for smartphones). 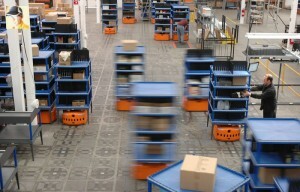 For ecommerce retailer Amazon, its purchase of Kiva Technologies for $775M in cash in April 2012 (almost two years ago, further eroding the trend argument), was also made to increase productivity and reduce costs, but in this case it was for fulfillment operations and not manufacturing. At the time of the acquisition, Amazon was cash rich, but fulfillment costs as a percentage of revenue were steadily increasing. The Kiva technology has proven to reduce the cost of pick-pack-ship operations and increase throughput at distribution centers, boosting profits in the process. Applied across Amazon’s many distribution and fulfillment centers, Kiva MPS would have a significant positive effect on the company’s profitability (something Amazon sorely lacks even as revenues increase). Amazon was also in the news following an announcement on CBSs’ 60 Minutes program that the company was evaluating the use of drone to deliver packages to Amazon customers. The gadget press went wild, but the announcement should be seen for what it was… a swarmy bit of self-promotion and boosterism, which coincidently came just before the announcement of Google’s robotics acquisitions (see below). Google generates the majority of its revenues selling Internet advertising, and is rapidly acquiring new companies and developing new technologies to broaden its offerings and reduce its dependence on a single revenue source. While not indicative of a general trend, Google’s announcement that it had acquired eight robotics and artificial intelligence technology start-ups as part of a major new robotics initiative was a watershed moment. Google purchased a total of eight privately held robotics companies for an undisclosed amount (estimated at only $80-$100M). These include Industrial Perception (IPI), Meka Robotics, Redwood Robotics, Bot & Dolly, Autofuss, Holomni, Schaft, and lastly, Boston Dynamics. The initial robotics announcements were followed in quick succession by Google’s purchase of home automation maker Nest Labs and Deepmind, an artificial intelligence start-up. The Nest acquisition will immediately drive revenue, but near term contributions by the other acquisitions are not clear. In media outlets and the blogosphere speculation was rampant, and ranged from the well-founded, to the speculative, and on to the absurd (although great reads all). Through their acquisition and initiatives, Google, Apple and Amazon have “blessed” robotics, and in the process dramatically increased the profile and legitimacy of robots and robotic technology. What is known is that of the eight purchased companies (really only five), none were public or substantial in size (employees, revenues etc.). Also, none had developed commercial-class products, or delivered robotic solutions targeted to mainstream, sizable markets (research robots, prototypes only). What Google did purchase were pieces that can serve as the generative component of a larger robotics solutions stack. Google’s acquisitions laid the groundwork for the company to become a robotics platform provider and industry accelerant. Software, including Robot Operating System (ROS) and Android, is key. The capabilities required to create new applications and products, whether by Google or others, is more important than the recent robotics acquisitions themselves. In summation, Google, Apple and Amazon’s robotics acquisitions and initiatives should not be seen as a turning point, but as part of a building wave of robotic technology proliferation into the workplace, public places and the home. This does not diminish the impact of the purchases and investments, and in fact increases their importance to the larger robotics community by continuing to normalize robotics technology. As their brand strength indicates, Google, Apple and Amazon have a cultural impact that exceeds that of other large, innovative companies with substantial robotics investments (for example, Rio Tinto for mining, GE for the industrial Internet and Boeing for unmanned aerial vehicles etc.). 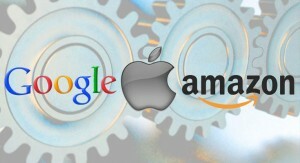 Through their acquisition and initiatives, Google, Apple and Amazon have “blessed” robotics, and in the process dramatically increased the profile and legitimacy of robots and robotic technology in the eyes of the business and investment community, especially the legitimacy of robotics as an investment opportunity. The acquisitions themselves demonstrated a clean, quick exit strategy and software-like ROI to a financial community that is often hesitant to invest in far-horizon, hardware-centric robotics start-ups.